Africa holds a very special place in my heart and after travelling through almost every other part of Southern Africa, Namibia has to be my favourite. Its ruggedness reminds me of the harshness of my own desert state, yet it has everything else that the rest of Africa has in terms of wildlife and a rich culturally diverse nation, but more importantly I felt completely 100% safe. On this trip I went solo, but it’s a place I would not hesitate to take young children or teens. It’s easy to hire a car and stay in cheap accommodation or hire a 4WD with all the camping gear and hit the road. The following top 5 places in Namibia are in my favourite order. Sossuvlei is a dry clay pan in the middle of the Namib desert and is surrounded by the highest moving sand dunes in the world. 7 kms from Sesriem, the entrance to the Namib-Naukluft Park, lies Big Daddy or Dune 7 rising 350m above the desert floor (the Dunes are numbered according to how far a way they are from Sesriem Gate). Not far from Sossuvlei is Deadvlei which used to be an oasis. Now all that remains is a dry clay pan with the remains of some dead acacia trees causing a stark and beautiful contrast against the surrounding looming red dunes. Sunrise is the best time to visit if you are wishing to climb a dune due to it being cooler, less tourist and of course for the amazing colours for keen photographers. I climbed Dune 45 and was not disappointed at the view I was treated to at the top. This whole area is a must see destination and one to put on the bucket list! Etosha National Park is Namibia’s premier wildlife sanctuary, an animal lover’s paradise and is unique in Africa. The park’s main characteristic is a salt pan so large it can be seen from space. There is abundant wildlife that congregates around the waterholes, giving you almost guaranteed game sightings. 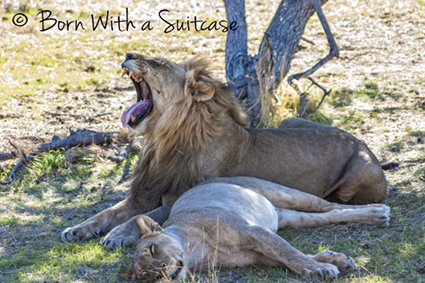 Etosha National Park is one of the most accessible game reserves in Namibia and Southern Africa. The park rivals wildlife seen at Kruger yet is more remote so does not attract as many visitors. This park is also Malaria free, accessible in a regular car and the rest camps provide a range of accommodation, restaurants, viewing decks, shops and petrol stations. Book ahead early to avoid disappointment. Giraffes are always my favourites as they are so graceful and elegant, that is if they’re not drinking, then they look just plain awkward! 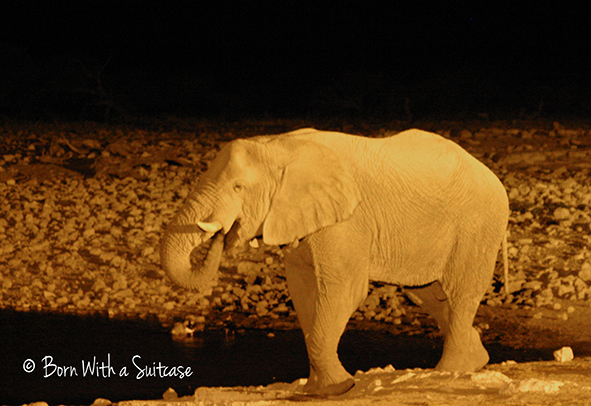 We visited the main 3 camps but Okaukuejo Rest Camp is my favourite because of the floodlit waterhole. The waterhole is a hub of animal activity and is the best time and place to see the endangered black rhino. On my last evening there I snuck back for one last look after everyone else at the camp had called it a day after a Black Rhino and its calf had left. I was treated my very own private viewing of a lone bull elephant. I will never forget that experience of just me and him separated by nothing more than a fence. It’s a moment I will cherish forever. 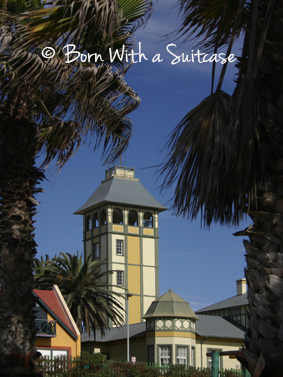 Wedged between the cool Pacific coast and the desert, Swakopmund is a great place to stop for a some R&R during a tour of Namibia. Its colonial German architecture sure makes for a picturesque town but is somewhat clinical with its cleanliness, manicured parks and general lack of excitement. However, delve further beneath surface of the usual tourist haunts and you’ll find a thriving and vibrant township of Mondesa on the outskirts of Swakopmund. After World War I, Namibia spent years under South African rule, and as a result became more and more closely integrated with its neighbour including its appalling apartheid regime, where the indigenous population were moved to townships. Most still remain there today due to their inability to rise out of poverty. For a more meaningful experience, participate in responsible tourism and give back to the local community by taking a township tour of Mondesa, not far across the proverbial other side of the railway track. This experience never left me and still l remains a favourite. The opportunity to meet and mingle with the locals in their own homes gave a real insight into the history and culture of the various tribes that have made their home here including the Nama, Herero and Damara, Visiting shanty homes, made from whatever can be obtained from the town’s refuse site was a very humbling experience. The locals make the best out of what they have to make loving homes for their families whilst remaining so happy, optimistic and hospitable. Across the other side of Mondesa, I am in Oma Lena’s home. She is a matriarch and elder of the Damara community and still wears the distinctive Victorian inspired traditional dress that the Damara (a throw back from the Victorian missionary days whereby mostly naked locals were made to cover up). As her grand children clamour all over her she gives an account of the township’s history by retelling her own personal sad story whereby her German husband was forced to leave Namibia during apartheid leaving her alone with her young children. I went from learning about the Damaraland people’s click language and herbal remedies to playing pool with the locals in a shebeen or a pub. The township children are so keen to pose in front of the camera and adored the attention they were getting. The afternoon is topped off by sampling some local food and being entertained by the local children doing the Ovambo dance. There is a more comprehensive account of my time in Mondesa in this blog post. Fish River Canyon is the largest canyon in Africa and the second largest in the world. So if you don’t think you’ll ever make it to the Grand Canyon or simply can’t stand the crowds, then don’t despair because this place is spectacular with hardly any tourists due to its relatively remote location. It’s 160 km long, 27 km at its widest point and 550 m at its deepest point. The surrounding landscape is also start and its rugged beauty unsurpassed. The plateau is also home to some remarkable looking Kokerbooms or Quiver trees named because bushmen traditionally used its branches to make quivers. The day I was there, a storm passed by and made for some spectacular scenery. The Skeleton Coast is the most unique coastal wildernesses in the world. Stretching from about 200 km north of Swakopmund towards the border with Angola, strong currents and massive storms and along this Atlantic coastline in conjunction with dense fog characteristic to this area have caused many ships to run aground over the years. The desolate coastline has become the world’s biggest ship graveyard. Any survivors still didn’t stand a chance due to the waterless, arid, 300 km wide desert that awaited them. On the Skeleton Coast is Cape Cross, the site where the first European explorer set foot in this area. In 1484 Portuguese navigator , Diogo Cão was ordered by King João II, to search for a sea route to India and the Spice Islands, In doing so, he claimed the land for Portugal by setting up a stone cross. Frankly, the area is a bit dull as all that remains is a replica of that cross. 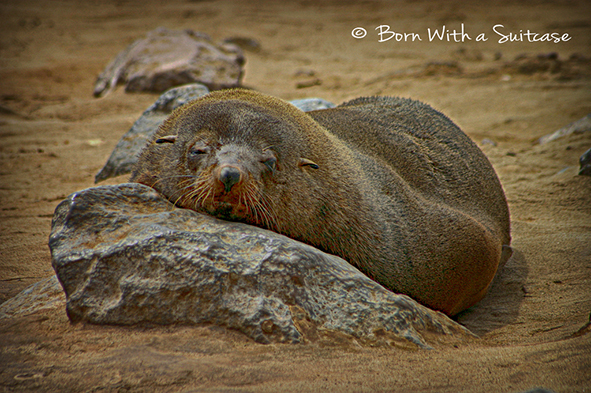 However, more interestingly, the area is home to the world’s largest Cape Fur Seal colony in the world. Beware, where there are seals, there is seal poo and seal poo really stinks. You’ll get accustomed to it after a while. My biggest disappointment was that I missed out seeing Kolmanskop where the moving dunes have engulfed a whole deserted town, but I gotta leave something for the next trip to add to my top 5 places in Namibia? Planning a fantastic trip can be overwhelming but I found www.namibian.org to be a fantastic site to start planning a trip there. Perhaps you do not have the time to plan a trip, don’t want to drive on dirt roads or simply wish for someone else to take care of everything for you, then consider a small group tour with G Adventures. They promote sustainable and responsible tourism and have some great tours including Namibia and surrounding countries to suit any style of traveller. Start planning your dream trip now! I’ve chosen this blog to be a part of Travel Photo Thursdays as sponsored by Budget Travellers Sandbox.